Complaints have been received from residents that careless, thoughtless dog owners are allowing their dogs to foul public places in Enderby, including the parks and children’s play areas. Enderby Parish Council is seeking to remind members of the public that dogs are not permitted inside any fenced or unfenced children’s play areas on Enderby’s Parks, and should be left outside. Incredibly, despite notices asking people not to do so, dogs are being taken into the gated areas. Toxocariasis is an infection of the roundworm toxocara canis. The eggs of the parasite can be found in soil or sand contaminated with faeces and if swallowed, result in infection that lasts between six and 24 months. Symptoms include eye disorders, vague ache, dizziness, nausea, asthma and, in extremely rare cases, seizures/fits. Often the eggs are ingested when passed to the mouth by the hands, but this can also occur through contact with dogs or other inanimate objects including balls, the wheels of toys and the soles of shoes. Infected soil samples are often found in play areas and as a result, Toxocariasis most commonly affects children between 18 months and five years. 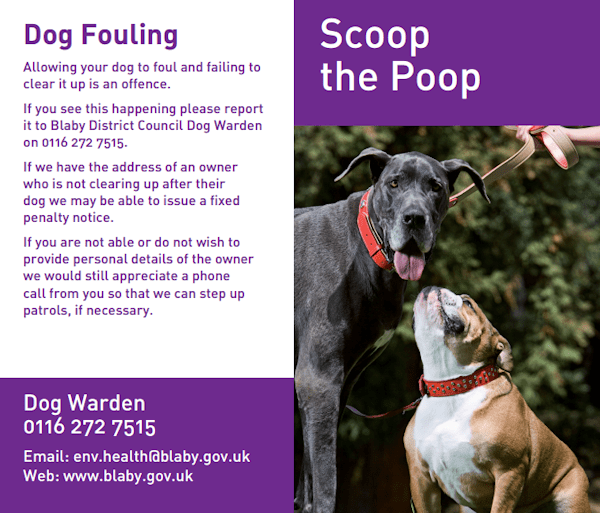 It is an offence to allow a dog to foul any area to which the public has access and when a dog has fouled it is an offence not to clean up the mess; being unaware the dog has fouled, or not having a suitable means of removing the faeces, is not a reasonable excuse for failing to clean up dog excrement. A fine of up to £1,000 may be the result. There really is no excuse. 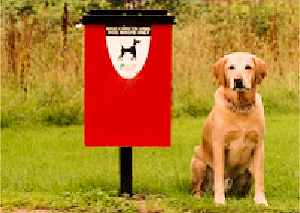 All Parks are equipped with red, dog waste bins and poop-scoop bags are available, free of charge, from Enderby Parish Council Offices, Blaby District Council and Enderby Library. Local councils and some other organisations currently enforce laws which mean you must clear up your dogs mess in public. Allowing your dog to foul in a public place and not cleaning it up could result in prosecution and a fine of up to £1000.